Q- Sulfuric acid can be produced from mined sulfur via the contact process. There are two stages represented below Molten Sulfur I Burner II Burner. 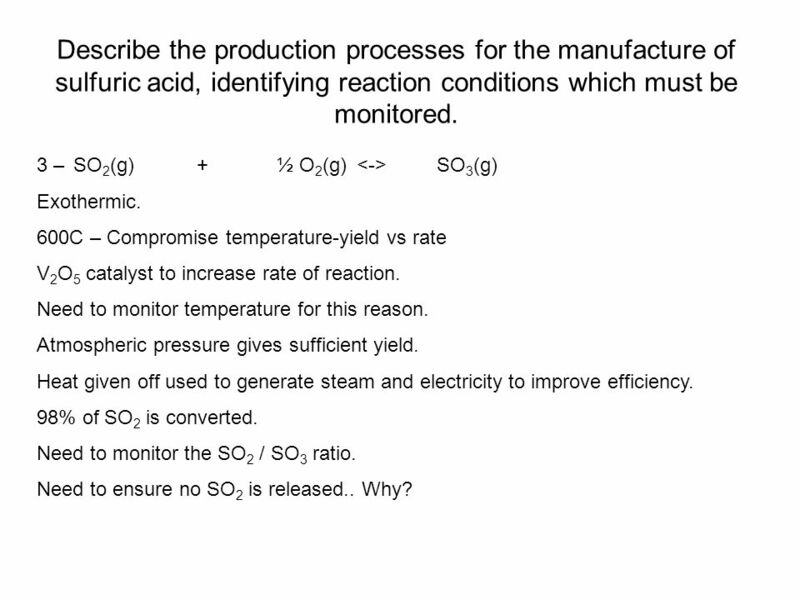 1 Q- Sulfuric acid can be produced from mined sulfur via the contact process. 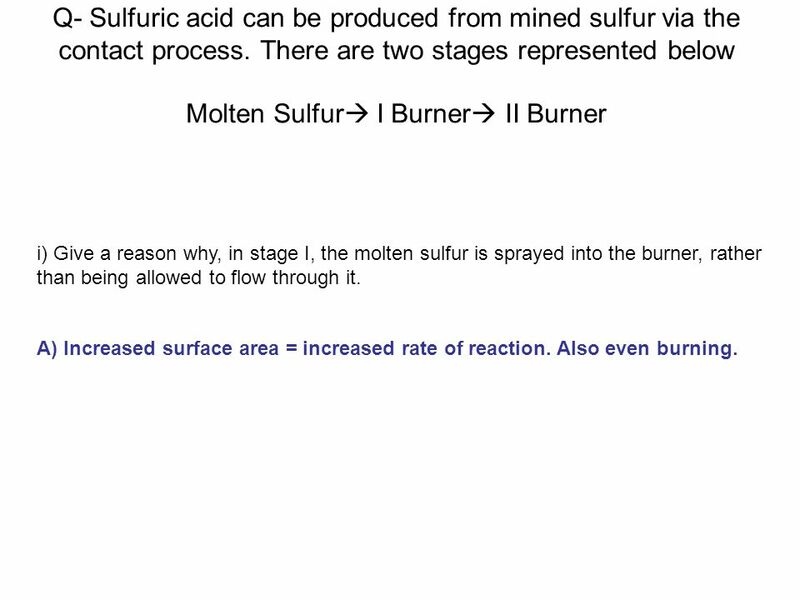 There are two stages represented below Molten Sulfur I Burner II Burner i) Give a reason why, in stage I, the molten sulfur is sprayed into the burner, rather than being allowed to flow through it. A) Increased surface area = increased rate of reaction. Also even burning. 2 Q- Sulfuric acid can be produced from mined sulfur via the contact process. 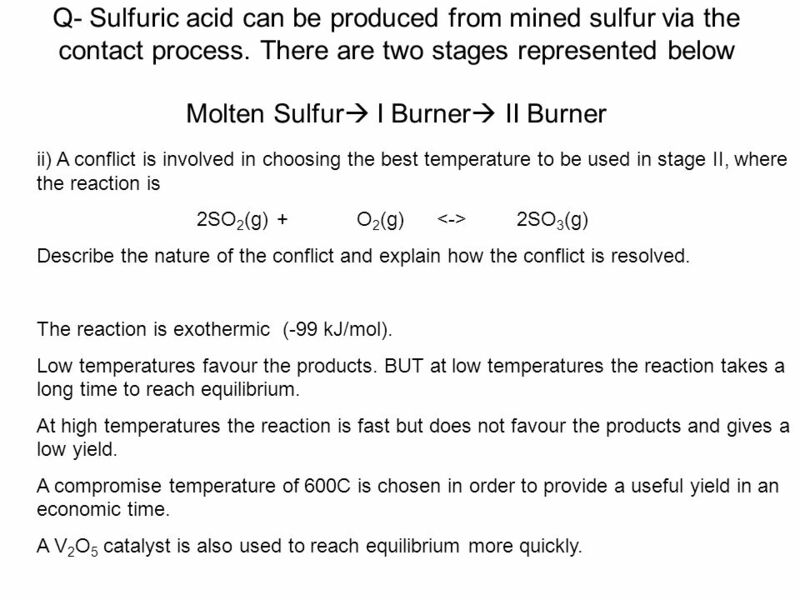 There are two stages represented below Molten Sulfur I Burner II Burner ii) A conflict is involved in choosing the best temperature to be used in stage II, where the reaction is 2SO2(g)	+	O2(g)	<->	2SO3(g) Describe the nature of the conflict and explain how the conflict is resolved. The reaction is exothermic (-99 kJ/mol). Low temperatures favour the products. BUT at low temperatures the reaction takes a long time to reach equilibrium. At high temperatures the reaction is fast but does not favour the products and gives a low yield. A compromise temperature of 600C is chosen in order to provide a useful yield in an economic time. A V2O5 catalyst is also used to reach equilibrium more quickly. 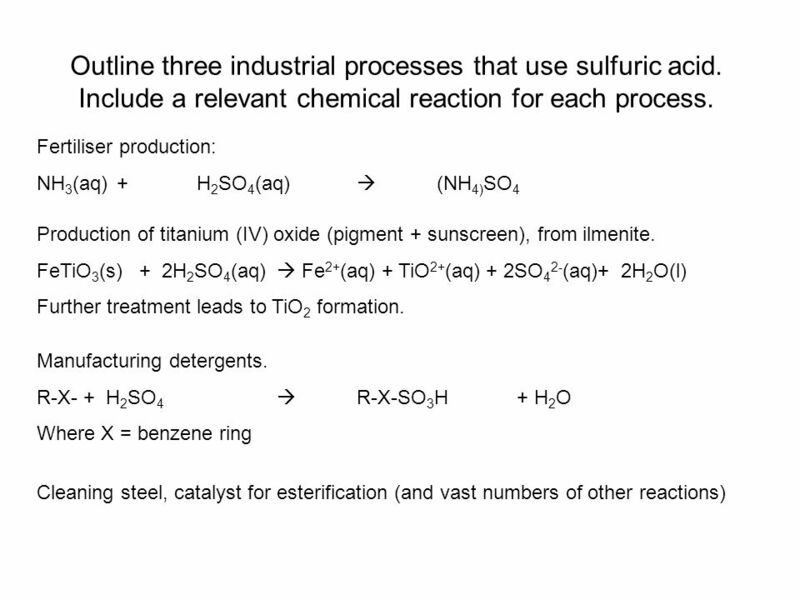 3 Q- Sulfuric acid can be produced from mined sulfur via the contact process. 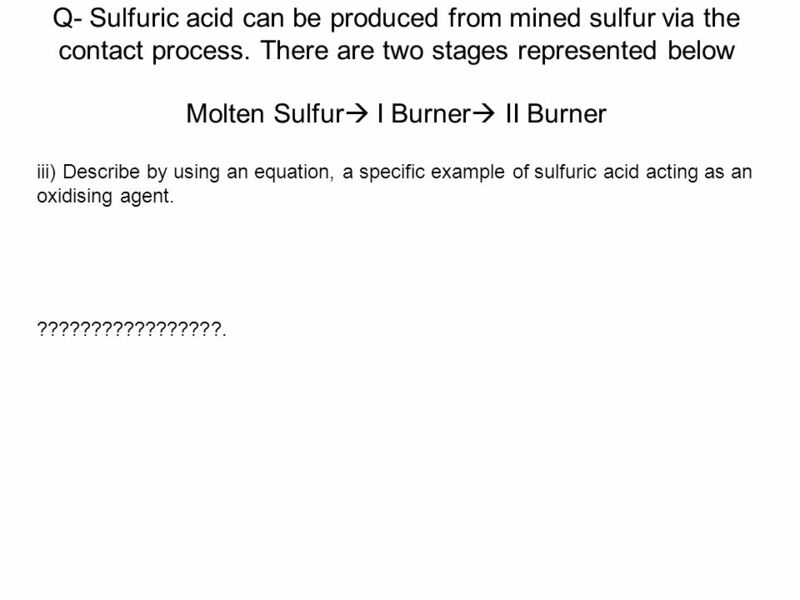 There are two stages represented below Molten Sulfur I Burner II Burner iii) Describe by using an equation, a specific example of sulfuric acid acting as an oxidising agent. ?????????????????. 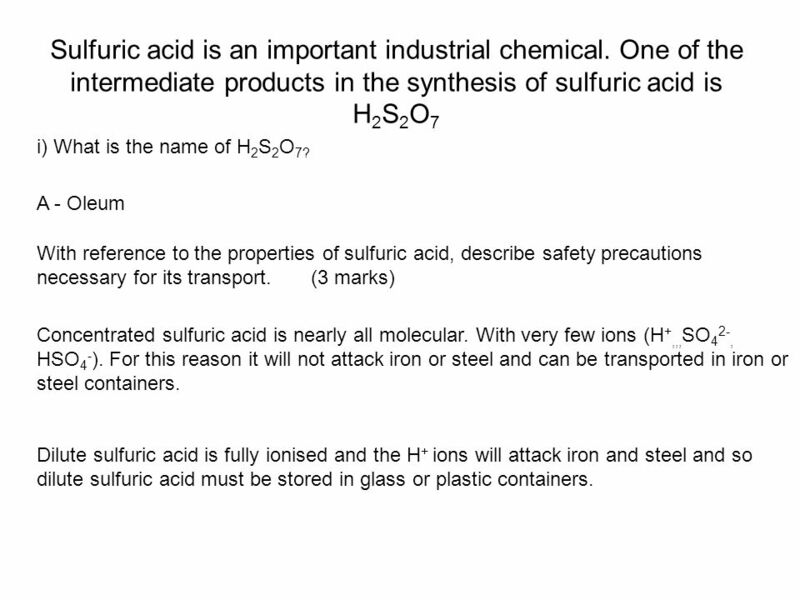 Sulfuric acid is an important industrial chemical. One of the intermediate products in the synthesis of sulfuric acid is H2S2O7 i) What is the name of H2S2O7? A - Oleum With reference to the properties of sulfuric acid, describe safety precautions necessary for its transport (3 marks) Concentrated sulfuric acid is nearly all molecular. With very few ions (H+,,,SO42-, HSO4-). For this reason it will not attack iron or steel and can be transported in iron or steel containers. Dilute sulfuric acid is fully ionised and the H+ ions will attack iron and steel and so dilute sulfuric acid must be stored in glass or plastic containers. 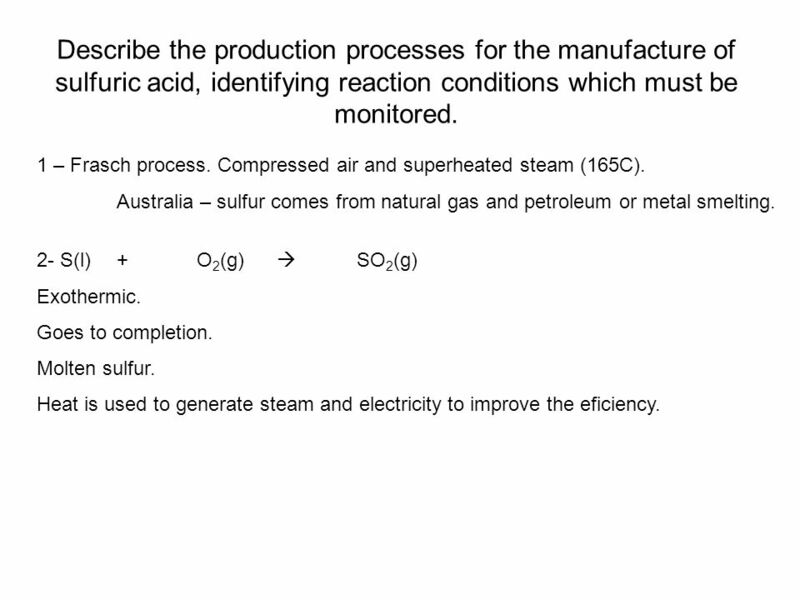 6 Describe the production processes for the manufacture of sulfuric acid, identifying reaction conditions which must be monitored. 1 – Frasch process. Compressed air and superheated steam (165C). Australia – sulfur comes from natural gas and petroleum or metal smelting. 2- S(l)	+	O2(g)		SO2(g) Exothermic. Goes to completion. Molten sulfur. Heat is used to generate steam and electricity to improve the eficiency. 7 Describe the production processes for the manufacture of sulfuric acid, identifying reaction conditions which must be monitored. 3 – SO2(g)	+	½ O2(g)	<->	SO3(g) Exothermic. 600C – Compromise temperature-yield vs rate V2O5 catalyst to increase rate of reaction. Need to monitor temperature for this reason. Atmospheric pressure gives sufficient yield. Heat given off used to generate steam and electricity to improve efficiency. 98% of SO2 is converted. Need to monitor the SO2 / SO3 ratio. Need to ensure no SO2 is released.. Why? 8 Describe the production processes for the manufacture of sulfuric acid, identifying reaction conditions which must be monitored. 4 – SO3(g)	+	H2SO4(l)		H2S2O7(l) SO3 reacted with conc sulfuric acid. 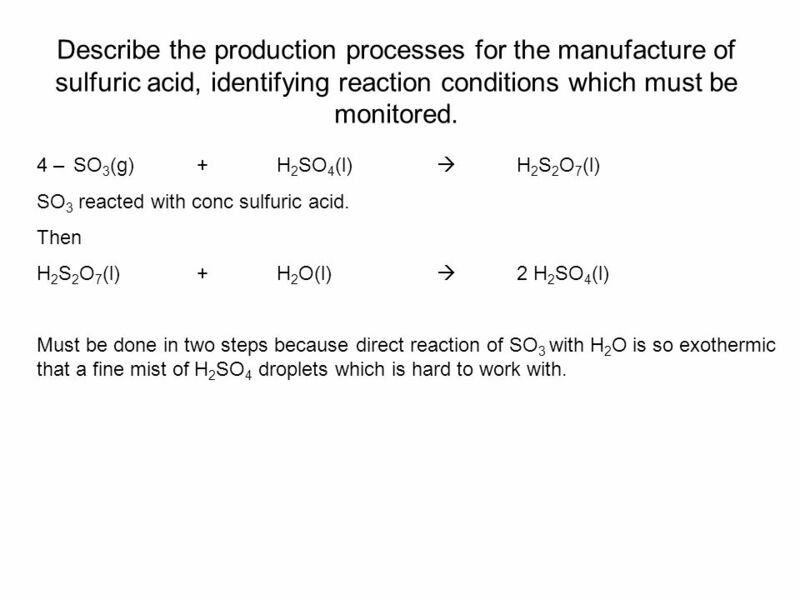 Then H2S2O7(l)	+	H2O(l)		2 H2SO4(l) Must be done in two steps because direct reaction of SO3 with H2O is so exothermic that a fine mist of H2SO4 droplets which is hard to work with. Download ppt "Q- Sulfuric acid can be produced from mined sulfur via the contact process. There are two stages represented below Molten Sulfur I Burner II Burner." INDUSTRIAL PROCESSES We try to obtain max. efficiency (min. waste, min. input of energy, and as rapid rxn as possible) in these processes. Max efficiency. 00:33 Syllabus/Unit: code: C2 Chemical Resources Lesson number: 5 Lesson Title: Manufacturing Chemicals - Ammonia Learning OutcomesHow I didTargets Learning. Jeopardy Types of Chemical Reactions Chemical Reactions Rate of Reaction Balancing Equations Q $100 Q $200 Q $300 Q $400 Q $500 Q $100 Q $200 Q $300 Q. Contact process KING OF CHEMICAL. What is it It is the method to produce high concentration of sulfuric acid for industrial needs. Equilibrium DP Chemistry R. Slider. Chemistry 1011 Slot 51 Chemistry 1011 TOPIC Gaseous Chemical Equilibrium TEXT REFERENCE Masterton and Hurley Chapter 12. What is ? Collision theory? Rate of reaction Activation energy? Chapter 19 – Production of Ammonia. Properties of Ammonia. Objectives: i. Outline the steps in the manufacture of ammonia from its elements, by the Haber Process. ii. Discuss the uses of ammonia iii. Assess the. Industrial chemistry Kazem.R.Abdollah (Asiaban) The Haber Process & The Ostwald Process 1. Making of ammonia from its elements. Fertilisers, fibers, plastics, nitric acid (explosives), household cleaners, detergents. Liquid nitrogen Group V. Nitrogen and its compounds.